Lymphoma is a group of blood cancers that develop from lymphocytes (a type of white blood cell). The name often refers to just the cancerous versions rather than all such tumors. Signs and symptoms may include enlarged lymph nodes, fever, drenching sweats, unintended weight loss, itching, and constantly feeling tired. The enlarged lymph nodes are usually painless. The sweats are most common at night. There are many subtypes of lymphomas. The two main categories of lymphomas are Hodgkin's lymphomas (HL) and the non-Hodgkin lymphomas (NHL). The World Health Organization (WHO) includes two other categories as types of lymphoma: multiple myeloma and immunoproliferative diseases. About 90% of lymphomas are non-Hodgkin lymphomas. Lymphomas and leukemias are a part of the broader group of tumors of the hematopoietic and lymphoid tissues. Risk factors for Hodgkin lymphoma include infection with Epstein–Barr virus and a history of the disease in the family. Risk factors for common types of non-Hodgkin lymphomas include autoimmune diseases, HIV/AIDS, infection with human T-lymphotropic virus, immunosuppressant medications, and some pesticides. Eating large amounts of red meat and tobacco smoking may also increase the risk. Diagnosis, if enlarged lymph nodes are present, is usually by lymph node biopsy. Blood, urine, and bone marrow testing may also be useful in the diagnosis. Medical imaging may then be done to determine if and where the cancer has spread. 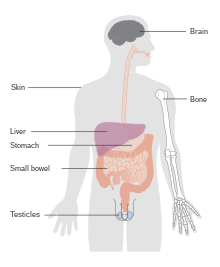 Lymphoma most often spreads to the lungs, liver, and brain. Treatment may involve one or more of the following: chemotherapy, radiation therapy, targeted therapy, and surgery. In some non-Hodgkin lymphomas, an increased amount of protein produced by the lymphoma cells causes the blood to become so thick that plasmapheresis is performed to remove the protein. Watchful waiting may be appropriate for certain types. The outcome depends on the subtype with some being curable and treatment prolonging survival in most. The five-year survival rate in the United States for all Hodgkin lymphoma subtypes is 85%, while that for non-Hodgkin lymphomas is 69%. Worldwide, lymphomas developed in 566,000 people in 2012 and caused 305,000 deaths. They make up 3–4% of all cancers, making them as a group the seventh-most common form. In children, they are the third-most common cancer. They occur more often in the developed world than the developing world. Lymphoma may appear as peritoneal lymphomatosis, as can be seen on CT scan. Image depicts non-Hodgkin lymphoma in a 17 year old HIV positive patient. A. Irregular homogenously enhancing wall thickening involving the ileocaecal region with aneurysmal dilatation of involved segments (curved arrow). B. Hepatosplenomegaly with hepatic metastasis (white arrows). Lymphomas in the strict sense are any neoplasms of the lymphatic tissues (lympho- + -oma) . The main classes are malignant neoplasms (that is, cancers) of the lymphocytes, a type of white blood cell that belongs to both the lymph and the blood and pervades both. 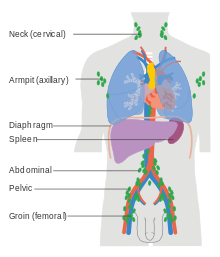 Thus, lymphomas and leukemias are both tumors of the hematopoietic and lymphoid tissues, and as lymphoproliferative disorders, lymphomas and lymphoid leukemias are closely related, to the point that some of them are unitary disease entities that can be called by either name (for example adult T-cell leukemia/lymphoma). Lymphoma can also spread to the central nervous system, often around the brain in the meninges, known as lymphomatous meningitis (LM). Hodgkin lymphoma accounts for about 15% of lymphomas. It differs from other forms of lymphoma in its prognosis and several pathological characteristics. A division into Hodgkin and non-Hodgkin lymphomas is used in several of the older classification systems. 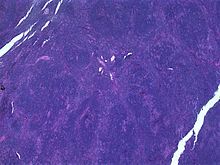 A Hodgkin lymphoma is marked by the presence of a type of cell called the Reed–Sternberg cell. Epstein-Barr virus-associated lymphoproliferative diseases are a group of benign, pre-malignant, and malignant diseases of lymphoid cells, i.e. B cells, T cells, NK cells, and histiocytic-dendritic cells in which one or more of these cell types is infected with the Epstein-Barr virus (EBV). The virus may be responsible for the development and/or progression of these diseases. 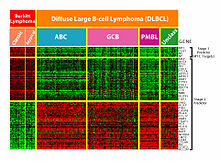 In addition to EBV-positive Hodgkin lymphomas, the World Health Organization (2016) includes the following lymphomas, when associated with EBV infection, in this group of diseases: Burkitt lymphoma; large B cell lymphoma, not otherwise specified; diffuse large B cell lymphoma associated with chronic inflammation; fibrin-associated diffuse large cell lymphoma; primary effusion lymphoma; plasmablastic lymphoma; extranodal NK/T cell lymphoma, nasal type; peripheral T cell lymphoma, not otherwise specified; angioimmunoblastic T cell lymphoma; follicular T cell lymphoma; and systemic T cell lymphoma of childhood. The Ann Arbor staging system is routinely used for staging of both HL and NHL. In this staging system, I represents a localised disease contained within a lymph node group, II represents the presence of lymphoma in two or more lymph nodes groups, III represents spread of the lymphoma to lymph nodes groups on both sides of the diaphragm, and IV indicates spread to tissue outside the lymphatic system. Different suffixes imply involvement of different organs, for example S for the spleen and H for the liver. Extra-lymphatic involvement is expressed with the letter E. In addition, the presence of B symptoms or their absence is expressed with B and A, respectively. B symptoms are defined as the presence of one of three symptoms: Unintentional weightloss of 10% body weight in the last 6 months, night sweats, and persistent fever of 38 °C or more. CT scan or PET scan imaging modalities are used to stage a cancer. PET scan is advised for FDG avid lymphomas, for example Hodgkins Lymphoma as a staging tool that can even replace bone marrow biopsy. For other lymphomas CT scan is recommended for staging. Certain lymphomas (extranodal NK/T-cell lymphoma, nasal type and type II enteropathy-associated T-cell lymphoma) can be mimicked by two benign diseases which involve the excessive proliferation of non-malignant NK cells in the GI tract, natural killer cell enteropathy, a disease wherein NK cell infiltrative lesions occur in the intestine, colon, stomach, or esophagus, and lymphomatoid gastropathy, a disease wherein these cells' infiltrative lesions are limited to the stomach. These diseases do not progress to cancer, may regress spontaneously and do not respond to, and do not require, chemotherapy or other lymphoma treatments. Treatment of some other, more aggressive, forms of lymphoma[which?] can result in a cure in the majority of cases, but the prognosis for patients with a poor response to therapy is worse. Treatment for these types of lymphoma typically consists of aggressive chemotherapy, including the CHOP or R-CHOP regimen. A number of people are cured with first-line chemotherapy. Most relapses occur within the first two years, and the relapse risk drops significantly thereafter. For people who relapse, high-dose chemotherapy followed by autologous stem cell transplantation is a proven approach. ^ a b c d e f g h i j k "General Information About Adult Hodgkin Lymphoma". National Cancer Institute. 2014-04-23. Archived from the original on 5 July 2014. Retrieved 20 June 2014. ^ a b c d e f g h i j k l m n "General Information About Adult Non-Hodgkin Lymphoma". National Cancer Institute. 2014-04-25. Archived from the original on 5 July 2014. Retrieved 20 June 2014. ^ a b Kamper-Jørgensen, M; Rostgaard, K; Glaser, SL; Zahm, SH; Cozen, W; Smedby, KE; Sanjosé, S; Chang, ET; Zheng, T; La Vecchia, C; Serraino, D; Monnereau, A; Kane, EV; Miligi, L; Vineis, P; Spinelli, JJ; McLaughlin, JR; Pahwa, P; Dosman, JA; Vornanen, M; Foretova, L; Maynadie, M; Staines, A; Becker, N; Nieters, A; Brennan, P; Boffetta, P; Cocco, P; Hjalgrim, H (September 2013). "Cigarette smoking and risk of Hodgkin lymphoma and its subtypes: a pooled analysis from the International Lymphoma Epidemiology Consortium (InterLymph)". Annals of Oncology. 24 (9): 2245–55. doi:10.1093/annonc/mdt218. PMC 3755332. PMID 23788758. ^ a b "Hodgkin Lymphoma—SEER Stat Fact Sheets". Seer.cancer.gov. Archived from the original on 2012-10-17. Retrieved 2012-08-26. ^ a b Taylor, Elizabeth J. (2000). Dorland's Illustrated medical dictionary (29th ed.). Philadelphia: Saunders. p. 1038. ISBN 0721662544. ^ Aditya Bardia (2010). Johns Hopkins Patients' Guide to Lymphoma. Jones & Bartlett Learning. p. 6. ISBN 9781449631413. Archived from the original on 2017-09-10. ^ a b c The Lymphoma Guide Information for Patients and Caregivers (pdf). Leukemia and Lymphoma Society. 2013. Archived (PDF) from the original on 14 July 2014. Retrieved 20 June 2014. ^ a b c d World Cancer Report 2014. World Health Organization. 2014. pp. Chapter 5.13. ISBN 9283204298. ^ "Lymphoma". NCI. Archived from the original on 5 July 2014. Retrieved 13 June 2014. ^ Vardiman JW, Thiele J, Arber DA, Brunning RD, Borowitz MJ, Porwit A, Harris NL, Le Beau MM, Hellström-Lindberg E, Tefferi A, Bloomfield CD (Jul 30, 2009). "The 2008 revision of the World Health Organization (WHO) classification of myeloid neoplasms and acute leukemia: rationale and important changes". Blood. 114 (5): 937–51. doi:10.1182/blood-2009-03-209262. PMID 19357394. ^ Hu, L; Luo, D; Zhou, T; Tao, Y; Feng, J; Mei, S (12 August 2017). "The association between non-Hodgkin lymphoma and organophosphate pesticides exposure: A meta-analysis". Environmental pollution (Barking, Essex : 1987). 231 (Pt 1): 319–328. doi:10.1016/j.envpol.2017.08.028. PMID 28810201. ^ Yang, L; Dong, J; Jiang, S; Shi, W; Xu, X; Huang, H; You, X; Liu, H (November 2015). "Red and Processed Meat Consumption Increases Risk for Non-Hodgkin Lymphoma: A PRISMA-Compliant Meta-Analysis of Observational Studies". Medicine. 94 (45): e1729. doi:10.1097/MD.0000000000001729. PMC 4912242. PMID 26559248. ^ Solimini, AG; Lombardi, AM; Palazzo, C; De Giusti, M (May 2016). "Meat intake and non-Hodgkin lymphoma: a meta-analysis of observational studies". Cancer Causes & Control. 27 (5): 595–606. doi:10.1007/s10552-016-0745-2. PMID 27076059. ^ "SEER Stat Fact Sheets: Non-Hodgkin Lymphoma". NCI. Archived from the original on 6 July 2014. Retrieved 18 June 2014. ^ Marcus, Robert (2013). Lymphoma : pathology, diagnosis and treatment (Second ed.). p. 1. ISBN 9781107010598. Archived from the original on 2015-09-06. ^ Tepper, John E. Niederhuber, James O. Armitage, James H. Doroshow, Michael B. Kastan, Joel E. (2014). "Childhood lymphoma". Abeloff's clinical oncology (Fifth ed.). p. Chapter 97. ISBN 1455728659. ^ a b c d e f "About Lymphoma". Lymphoma Research Foundation. Archived from the original on 2 December 2012. Retrieved 22 December 2012. ^ a b c d e f g h "Warning Signs of Lymphoma — First Signs of Lymphoma". Lymphoma.about.com. Archived from the original on 2012-11-18. Retrieved 2012-12-01. ^ Mallick, Indranil. "How Is Lymphoma Diagnosed?". lymphoma.about.com. Archived from the original on 16 January 2013. Retrieved 22 December 2012. ^ Canova, F; Marino, D; Trentin, C; Soldà, C; Ghiotto, C; Aversa, SM (August 2011). "Intrathecal chemotherapy in lymphomatous meningitis". Critical reviews in oncology/hematology. 79 (2): 127–34. doi:10.1016/j.critrevonc.2010.07.005. PMID 20696592. ^ "Hodgkins Lymphoma Incidence". Retrieved 2 October 2017. ^ National Cancer Institute. "What You Need To Know About Hodgkin Lymphoma". U.S. Dept of Health and Human Services, (online at "Archived copy" (PDF). Archived from the original (PDF) on 2014-01-24. Retrieved 2013-08-05. CS1 maint: Archived copy as title (link)), pg 4. ^ Rezk SA, Zhao X, Weiss LM (June 2018). "Epstein - Barr virus - associated lymphoid proliferations, a 2018 update". Human Pathology. doi:10.1016/j.humpath.2018.05.020. PMID 29885408. ^ a b Jaffe, ES; Harris, NL; Vardiman, JW; Campo, E; Arber, DA. (2011). Hematopathology (1st ed.). Elsevier Saunders. ISBN 9780721600406. ^ Swerdlow, Steven H.; International Agency for Research on Cancer; World Health Organization (2008). WHO classification of tumours of haematopoietic and lymphoid tissues. World Health Organization classification of tumours. 2 (4th ed.). International Agency for Research on Cancer. ISBN 9789283224310. Archived from the original on 2015-02-11. ^ Wagman LD. (2008). "Principles of Surgical Oncology". In Pazdur R, Wagman LD, Camphausen KA, Hoskins WJ (eds.). Cancer Management: A Multidisciplinary Approach (11th ed.). CMPMedica. ISBN 9781891483622. Archived from the original on 2013-10-04. ^ "Chronic Leukemias". The Merck Manual of Geriatrics. Archived from the original on 2010-07-04. 50% for limited stage: Leitch HA, Gascoyne RD, Chhanabhai M, Voss NJ, Klasa R, Connors JM (October 2003). "Limited-stage mantle-cell lymphoma". Ann. Oncol. 14 (10): 1555–61. doi:10.1093/annonc/mdg414. PMID 14504058. 70% for advanced stage: Herrmann A, Hoster E, Zwingers T, Brittinger G, Engelhard M, Meusers P, Reiser M, Forstpointner R, Metzner B, Peter N, Wörmann B, Trümper L, Pfreundschuh M, Einsele H, Hiddemann W, Unterhalt M, Dreyling M (February 2009). "Improvement of overall survival in advanced stage mantle cell lymphoma". J. Clin. Oncol. 27 (4): 511–8. doi:10.1200/JCO.2008.16.8435. PMID 19075279. ^ Turgeon, Mary Louise (2005). Clinical Hematology: Theory and Procedures. 936 (4 ed.). Lippincott Williams & Wilkins. pp. 285–6. ISBN 978-0-7817-5007-3. Archived from the original on 2015-09-06. ^ Diviné M, Casassus P, Koscielny S, Bosq J, Sebban C, Le Maignan C, Stamattoulas A, Dupriez B, Raphaël M, Pico JL, Ribrag V (December 2005). "Burkitt lymphoma in adults: a prospective study of 72 patients treated with an adapted pediatric LMB protocol". Ann. Oncol. 16 (12): 1928–35. doi:10.1093/annonc/mdi403. PMID 16284057. ^ Kirova YM, Piedbois Y, Haddad E, Levy E, Calitchi E, Marinello G, Le Bourgeois JP (May 1999). "Radiotherapy in the management of mycosis fungoides: indications, results, prognosis. Twenty years experience". Radiother Oncol. 51 (2): 147–51. doi:10.1016/S0167-8140(99)00050-X. PMID 10435806. ^ Clarke CA, Glaser SL, Dorfman RF, Bracci PM, Eberle E, Holly EA (January 2004). "Expert review of non-Hodgkin lymphomas in a population-based cancer registry: reliability of diagnosis and subtype classifications". Cancer Epidemiol. Biomarkers Prev. 13 (1): 138–43. doi:10.1158/1055-9965.EPI-03-0250. PMID 14744745. ^ Xia D, Morgan EA, Berger D, Pinkus GS, Ferry JA, Zukerberg LR (January 2019). "NK-Cell Enteropathy and Similar Indolent Lymphoproliferative Disorders: A Case Series With Literature Review". American Journal of Clinical Pathology. 151 (1): 75–85. doi:10.1093/ajcp/aqy108. PMID 30212873. ^ Sweetenham JW (November 2009). "Treatment of lymphoblastic lymphoma in adults". Oncology (Williston Park, N.Y.). 23 (12): 1015–20. PMID 20017283. ^ Elphee EE (May 2008). "Understanding the concept of uncertainty in patients with indolent lymphoma". Oncol Nurs Forum. 35 (3): 449–54. doi:10.1188/08.ONF.449-454. 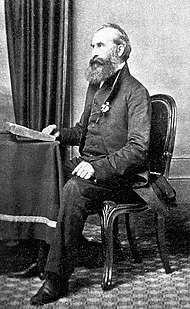 PMID 18467294. ^ Ansell SM (2014). "Follicular lymphoma: Watch and wait is watch and worry". The Lancet Oncology. 15 (4): 368–9. doi:10.1016/S1470-2045(14)70066-X. PMID 24602759. ^ Bernstein SH, Burack WR; Burack (2009). "The incidence, natural history, biology, and treatment of transformed lymphomas". Hematology Am Soc Hematol Educ Program. 2009: 532–41. doi:10.1182/asheducation-2009.1.532. PMID 20008238. ^ Jenkins EC (Jan 1972). "Wire-loop application of liquid emulsion to slides for autoradiography in light microscopy". Stain technology. 47 (1): 23–6. doi:10.3109/10520297209116530. PMID 4550425. ^ Philip T, Guglielmi C, Hagenbeek A, Somers R, Van der Lelie H, Bron D, Sonneveld P, Gisselbrecht C, Cahn JY, Harousseau JL (Dec 7, 1995). "Autologous bone marrow transplantation as compared with salvage chemotherapy in relapses of chemotherapy-sensitive non-Hodgkin's lymphoma". The New England Journal of Medicine. 333 (23): 1540–5. doi:10.1056/nejm199512073332305. PMID 7477169. ^ Martin NE, Ng AK; Ng (November 2009). "Good things come in small packages: low-dose radiation as palliation for indolent non-Hodgkin lymphomas". Leuk. 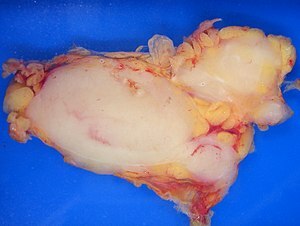 Lymphoma. 50 (11): 1765–72. doi:10.3109/10428190903186510. PMID 19883306. ^ Kuruvilla J (2009). "Standard therapy of advanced Hodgkin lymphoma". Hematology Am Soc Hematol Educ Program. 2009: 497–506. doi:10.1182/asheducation-2009.1.497. PMID 20008235. ^ Viviani S, Zinzani PL, Rambaldi A, Brusamolino E, Levis A, Bonfante V, Vitolo U, Pulsoni A, Liberati AM, Specchia G, Valagussa P, Rossi A, Zaja F, Pogliani EM, Pregno P, Gotti M, Gallamini A, Rota Scalabrini D, Bonadonna G, Gianni AM (2011). "ABVD versus BEACOPP for Hodgkin's lymphoma when high-dose salvage is planned". New England Journal of Medicine. 365 (3): 203–12. doi:10.1056/NEJMoa1100340. PMID 21774708. ^ Ferrell B, Connor SR, Cordes A, Dahlin CM, Fine PG, Hutton N, Leenay M, Lentz J, Person JL, Meier DE, Zuroski K (2007). "The national agenda for quality palliative care: the National Consensus Project and the National Quality Forum". J Pain Symptom Manage. 33 (6): 737–44. doi:10.1016/j.jpainsymman.2007.02.024. PMID 17531914. ^ a b Higginson IJ, Evans CJ; Evans (2010). "What is the evidence that palliative care teams improve outcomes for cancer patients and their families?". Cancer J. 16 (5): 423–35. doi:10.1097/PPO.0b013e3181f684e5. PMID 20890138. ^ "Palliative Care: It's for Caregivers Too, Says Study". Archived from the original on 2014-06-01. Retrieved 2014-08-21. ^ Heath JA, Clarke NE, Donath SM, McCarthy M, Anderson VA, Wolfe J (2010). "Symptoms and suffering at the end of life in children with cancer: an Australian perspective". Med J Aust. 192 (2): 71–5. PMID 20078405. ^ Schmidt P, Otto M, Hechler T, Metzing S, Wolfe J, Zernikow B (2013). "Did increased availability of pediatric palliative care lead to improved palliative care outcomes in children with cancer?". J Palliat Med. 16 (9): 1034–9. doi:10.1089/jpm.2013.0014. PMID 23901834. ^ Tang ST, Chang WC, Chen JS, Wang HM, Shen WC, Li CY, Liao YC (2013). "Course and predictors of depressive symptoms among family caregivers of terminally ill cancer patients until their death". Psychooncology. 22 (6): 1312–8. doi:10.1002/pon.3141. PMID 22836818. ^ Chung HM, Lyckholm LJ, Smith TJ (2009). "Palliative care in BMT". Bone Marrow Transplant. 43 (4): 265–73. doi:10.1038/bmt.2008.436. PMID 19151797. ^ "Providing Palliative Care to Family Caregivers Throughout the Bone Marrow Transplantation Trajectory". Archived from the original on 2013-08-12. Retrieved 2014-08-21. ^ "SEER Stat Fact Sheets: Lymphoma". Archived from the original on 2013-10-10. ^ Tran H, Nourse J, Hall S, Green M, Griffiths L, Gandhi MK (Sep 2008). "Immunodeficiency-associated lymphomas". Blood Reviews. 22 (5): 261–281. doi:10.1016/j.blre.2008.03.009. PMID 18456377. ^ "Understanding Clinical Trials for Blood Cancers" (PDF). The Leukemia & Lymphoma Society. Leukemia and Lymphoma Society. Archived from the original (pdf) on 5 January 2011. Retrieved 19 May 2010.